The ISO 9000 definition of quality improvement states that it is part of quality management focused on increasing the ability to fulfil quality requirements. In simple terms, quality improvement is anything which causes a beneficial change in quality performance. There are two basic ways of bringing about improvement in quality performance. One is by better control and the other by raising standards. We don't have suitable words to define these two concepts. Doing better what you already do is improvement but so is doing something new. Juran uses the term control for maintaining standards and the term breakthrough for achieving new standards. Imai uses the term Improvement when change is gradual and Innovation when it is radical. Hammer uses the term Reengineering for the radical changes. All beneficial change results in improvement whether gradual or radical so we really need a word which means gradual change or incremental change. The Japanese have the word Kaizen but there is no English equivalent that I know of other than the word improvement. Quality improvement (for better control) is a process for changing standards. It is not a process for maintaining or creating new standards. Standards are changed through a process of selection, analysis, corrective action on the standard or process, education and training. The standards which emerge from this process are an improvement from those used previously. A typical quality improvement might be to increase the achieved reliability of a range of products from 1 failure every 1000 hours to meet the specified target of 1 every 5000 hours. Another might be to reduce service call-out response time from an average of 38 hours to the maximum of 36 hours specified. Another might be simply to correct the weaknesses in the registered quality management system so that it will pass re-assessment. Quality improvement (raising standards or Innovation), is a process for creating new standards. It is not a process for maintaining or improving existing standards. Standards are created through a process which starts at a feasibility stage and progresses through research and development to result in a new standard proven for repeatable applications. Such standards result from innovations in technology, marketing and management. A typical quality improvement might be to redesign a range of products to increase the achieved reliability from 1 failure every 5000 hours to 1 failure every 10,000 hours. Another example might be to improve the efficiency of the service organization so as to reduce the guaranteed call-out time from the specified 36 hours to 24 hours. A further example might be to design and install a quality system which complies with ISO 9001. 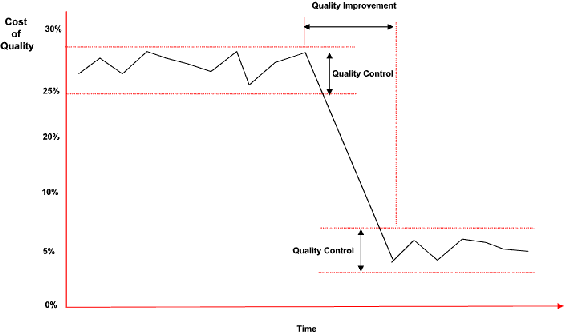 The transition between where quality improvement stops and quality control begins is where the level has been set and the mechanisms are in place to keep quality on or above the set level. In simple terms if quality improvement reduces quality costs from 25% of turnover to 10% of turnover, the objective of quality control is to prevent the quality costs rising above 10% of turnover. This is illustrated below. Improvement by better control is achieved through the corrective action mechanisms referred to in ISO 9001:2015 clause 10.2. Improvement by raising standards requires a different process. A process which results in new standards. Determine the objective to be achieved. e.g. new markets, products or technologies or new levels of organizational efficiency or managerial effectiveness, new national standards or government legislation. These provide the reasons for needing change. Determine the policies needed for improvement. i.e. the broad guidelines to enable management to cause or stimulate the improvement. Conduct a feasibility study. This should discover whether accomplishment of the objective is feasible and propose several strategies or conceptual solutions for consideration. If feasible, approval to proceed should be secured. Carry out research, analysis and design to define a possible solution and credible alternatives. Model and develop the best solution and carry out tests to prove it fulfils the objective. Implement the change i.e. putting new products into production and new services into operation.